Your coach will depart from the meeting point at 7am and returns around 7.30/8.00 pm. The Bernina Express is open all year. We are comparing Bernina Express and St.Moritz Day Tour from Milan Prices from leading ticket suppliers and Try to find you Cheap tickets prices on the market. Travelling on the Bernina Express you will cross the Italian-Swiss border, and continue along a UNESCO protected route through majestic scenery, climbing over the Bernina Pass and all the way to St Moritz Ski Resort. This is a full day round trip tailor made for nature lovers and outdoors enthusiasts. You'll begin your journey with a local English speaking guide, taking a comfortable bus from Milan's city centre to the quaint town of Tirano. When the conductor calls ‘all aboard' jump on the ‘Little Red Train and get your camera ready because over the following two and half hours you will be winding and climbing through spectacular Swiss Alps. At St Moritz you will have time to stroll to the azure blue lake, get lunch or visit a chocolaterie in the charming town or just sit back and soak up the views before returning to Milan. If you want to get a taste for the magnificent Swiss Alps but only have a short vacation time then this is a good option for you. You'll get to visit a quaint mountain town, a luxury ski resort and Europe's most famous railway line, in just one day. A must for photographers and outdoors enthusiasts. Your Experience With Bernina Express and St.Moritz Day Tour from Milan? Take a full day round trip from Central Milan in comfortable coach to the mountain town of Tirano and jump aboard the Bernina Express to exclusive Swiss resort, St.Moritz. Ride the newest and steepest alpine railway line, climbing through breathtaking scenery from 430 meters to 1,822 metres. Enjoy a unique sightseeing adventure in the company of a local guide. What Bernina Express and St.Moritz Day Tour from Milan Includes? Return transportation by air conditioned coach or mini-bus from Milan to Tirano. Return ticket for the Bernina Express (2nd class). Meet in Milan - drive to Tirano – take the Bernina Express to St Moritz – free time at the ski resort – return to Milan vis train and bus. Bring an extra layer, even in the summertime, because it will be substantially cooler at St Moritz than it is in Milan's city centre. Make sure you bring a fully charged camera. Travelers Reviews about Bernina Express and St.Moritz Day Tour from Milan? The Bernina Express and St Moritz day tour from Milan has a very high 4.5-star ratings on Viator and TripAdvisor. Both are trusted travellers websites. On Get Your Guide the tour has a 4.6-star rating. 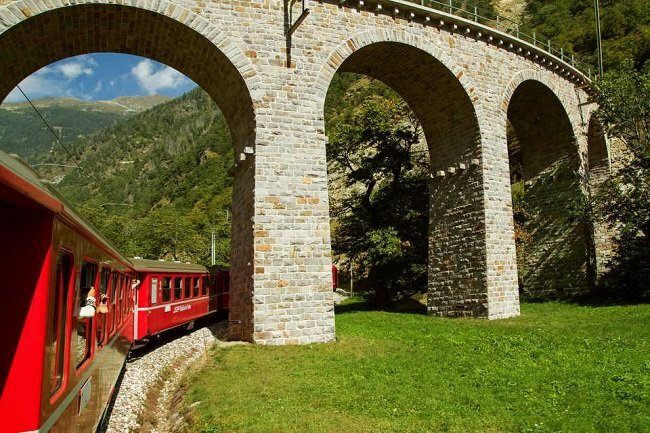 Travellers say that the Bernina Express is breath-taking and a fantastic experience. Comments point out that this is a long trip and have mentioned that some guides are not very enthusiastic. Overall the tour is very highly recommended. Wheelchair accessible but wheelchair user should be accompanied. Cancellations must be made at least 5 - 7 days in advance to receive a full refund. You must bring a valid passport and have any visa requirements prepared for the crossing the Italian-Swiss border. Tour providers will not take responsibility for travellers without correct documents.